Our first guest was Greg Sellentin, the editor and publisher of Mushing Magazine. We spoke about the “state of mushing”. 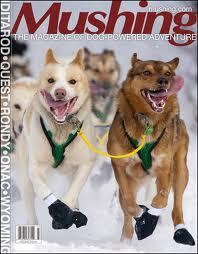 During our conversation we discussed how fans could best follow the sport: subscribe to Mushing Magazine of course! But also ask a lot of questions. New fans and novice musher’s alike will find that this sport has a great group of people that are willing to share their knowledge to anyone who asks. This is an exciting time for the sport of mushing. With the influx of socail media and just about every team having a blog, website, and Facebook pages, it makes it very easy for fans and mushers to give updates, share pictures and stories and give advice. We also spoke about the Iditarod and all of the festivities that surround the Iditarod circus, as I like to call it, leading up to the re-start in Willow on Sunday, March 4 at 2:00 pm. Greg brought up some great points about not jumping into this sport too quickly and to take your time. We encouraged new mushers to find a veteran to work with for a time before they venture out on their own. During the show it was equal parts education and an overview of the sport. The half-hour show went very quickly and we invited Greg back on any time. It was a great conversation. Starting Saturday March 3, at 9:30 am we will cover the ceremonial start in Anchorage then on Sunday the re-start in Willow at 1:30 pm and our daily coverage at 6:30 pm up until the awards banquet, some ten days (or so) later. It should be a fun time and we look forward to your comments and questions.